1. Mission Impossible: As they lower Pinocchio to rescue Shrek, Donkey and Puss. 2. Rocky Horror Picture Show: Around the table at dinner the King, Queen, Shrek, Fiona and Donkey calling each other's names. 3. Lord of the Rings: At the beginning, the entire ring sequence. 4. Lord of the Rings: The sign for The Poison Apple is shown in exactly the same manner as the sign of The Prancing Pony. 5. Lord of the Rings: When the King enters he Poison Apple it is very similar to the way that the hobbits enter the Prancing Pony. 6. Lord of the Rings: Donkey, Shrek and Puss are locked in the tower. The camera pans up while Donkey is screaming his head off, very similar to Gollum in Barad-Dur. 7. Lord of the Rings: Fairy Godmother starts using her wand to slam doors in Shrek's face, very similar to Saruman vs. Gandalf. 8. Lord of the Rings: Mongo kicks his flaming gumdrop button up on the wall, taking out a portion of the wall as well as several soldiers, very similar to a rock hitting the walls of Minas Tirith. 9. Lord of the Rings: When King Harold meets Puss n Boots for the first time, he enters a darkened room with a darkened figure in the back, with the light from the window only shining on his legs, exactly how Frodo first sees Aragorn or "Strider". 10. 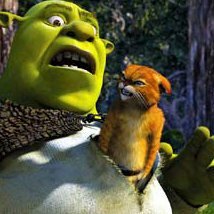 Lord of the Rings: When Shrek was in the castle, Donkey (stallion) came running up, Shrek was in front of him and he jumped on like Legolas did. 11. Beverly Hills Cop: The looking-up pan of the palm trees as the carriage rolls into Far Far Away. 12. The Mask of Zorro: Puss slashing the P into the tree. 13. Indiana Jones: Raiders of the Lost Ark: Puss' rescue of his hat from under the potion chamber's door is from one of the movies. 14. Indiana Jones: Raiders of the Lost Ark: When Shrek wanted to get the diary from the box, he rubbed his fingers together and then quickly lifted the lid and took the book out. That was just like Indiana, before he picked up the idol in the beginning of the movie. 15. Jaws: The sharks that devour the mermaid. 16. Alien: When Puss 'n' Boots is crawling in Shrek's clothes and bursts out the front of his shirt. 17. Flashdance: When Puss says "take your clothes off and go dancing in the rain," then sits down on a chair, and pulls a chain to have water fall on him. 18. 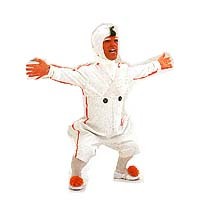 Willy Wonka and the Chocolate Factory: In the Fairy Godmother's factory, her workers were like Oompa Loompas. 19. E.T. : As the gingerbread man is falling into the water, the "Be gooood"
20. Love Potion #9: The love potion puss swipes, Love potion IX. 21. Volcano: When the fireball comes flying out of the castle, and hits Mongo. 22. The Princess Bride: Puss in Boots switches sides with Shrek to fight for honor. 23. The Princess Bride: Puss staying behind to fight the guards in the siege of the castle. 24. Honey I Blew Up the Kid: When Mongo tries to get a cup off a building, and drink it and Donkey says: "Follow the Pony!". 25. Frankenstein: "It's alive!" The baker, when he is making Mongo. 26. Ghost Busters 2: As Mongo walked through the streets of Far Far Away people were running and screaming, like in Ghost Busters 2, when the giant "STAYPUFT" marshmallow man walked through New York City. 27. Jurassic Park: Mongo's initial introduction with the ripples in the coffee cups. 28. This Is Spinal Tap: In Fiona's room, there was a poster that said "Stonehenge" up top, a blonde guy in a knight outfit holding a microphone, and the other guy, dark haired playing a mandolin. 29. Blazing Saddles: One of the character's name is Mongo. 30. Footloose: Not only was the same song used but the "Hero" scene near the end was a lot like the tractor race scene in Footloose. 31. The Shining: When Shrek goes through Fiona diary and at the end all the pages have "Mrs. Fiona Charming" written differently. 32. Annie: Donkey attempts to cheer Shrek up by singing "The sun will come out tomorrow..."
33. Lethal Weapon: When Shrek and Fiona arrive in Far Far Away, they pass a movie theater playing Lethal Arrow 4. 34. The Godfather: The Fairy Godmother. The way the king owes her a favor for a past favor, when she picks him up in the car with the two big bodyguards and the line, "you're making me do things I don't like to do." or something of that sort. 35. 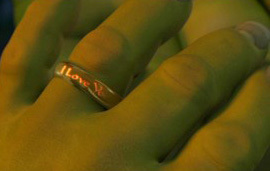 From Here to Eternity: During the honeymoon montage, when Shrek and Fiona are kissing on the beach. 36. Cabaret: At the end of the movie, Puss-in-Boots says he is going to the "Kit-Kat Klub", which was the name of the club in this movie. 37. Star Wars: The palace where Donkey, Shrek, and Puss are held prisoner is Jabba the Hutt's palace. 38. Star Wars: The way in which Puss fights agaisnt the guards is similar to the way Yoda fought in Attack of the Clones. 39. Meet the Parents: When Fiona's mom is in bed reading a book, and Fiona's dad is complaining about how Shrek isn't right for their daughter. 40. The Graduate: Shrek bangs on a distant window and yells "Fiona!" repeatedly while she is with her future husband. 41. The Fabulous Baker Boys: Fairy Godmother in a very similar dress to Michelle Pfeifer singing seductively on the piano. 42. Godzilla: Mongo howls in anger, it's a direct sound lift of the Godzilla scream. 43. Seven Year Itch: Fairy Godmother's first song when she makes Fiona's dress go up in the same manner that a vent made Monroe's dress go up. 44. Pretty Woman: When the Fairy Godmother was naming off all the stories that ended happily ever after without ogres, she mentioned Pretty Women. 45. Predator: When we first see Donkey and Shrek wandering through the woods looking for the king from Puss in Boot's angle, the camera shot and the sound of his purr are both from Predator. 46. The Matrix Reloaded: After Pinocchio and Gingerbread man free Shrek from his chains, he drops to the ground in the exact same way Neo drops to the ground (One knee and one arm down in front of a dark gray brick wall). 47. The Wizard of Oz: the way the Fairy Godmother appeared by coming in bubbles like the Good Witch did. 48. The Wizard of Oz: The trees in the Poison Apple. 49. The Wizard of Oz: After it starts to rain, Donkey screams, "I'm melting! I'm melting!" 50. The Wizard of Oz: When Shrek gets to Far Far Away, he says something like, "We're definitely not in the swamp anymore." 51. Spiderman: When Shrek is hanging upside down covered in mud, Fiona wipes away the mud on his face and kisses him. 52. Spiderman: "My donkey senses are tingling all over".